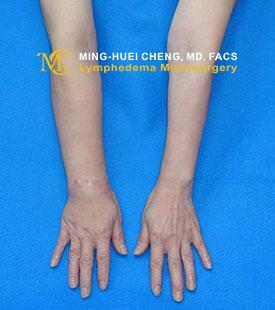 What Is Upper Extremity Lymphedema? Breast cancer patients who underwent axillary lymph node dissection following radiotherapy are at a higher risk of developing extremity lymphedema – Breast Cancer-Related Lymphedema (BCRL), a condition that results in tissue swelling and liquid retention in the arms. While it is possible to manage the condition with some home care, surgery may be necessary to significantly improve an individual’s comfort and quality of life. 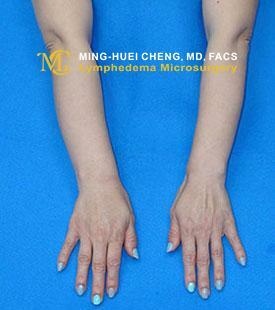 Ming-Heui Cheng, MD, FACS, a pioneer in plastic microsurgery and internationally renowned lymphedema specialist, performs vascularized lymph node flap transfers on lymphedema patients whose symptoms have not improved or continue to worsen six months after they emerged. The affected limb may develop inflammation, infection, adipogenesis, and fibrosis of the tissue. The protein-concentrated fluid that accumulates inside the interstitial tissue may further block or make the drainage of the lymph fluid less efficient or even create an obstruction. 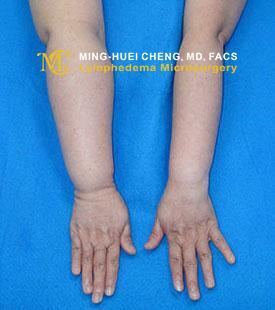 Lymphedema of upper extremity causes pain, heaviness, skin hyperkeratosis, fibrosis, discomfort when wearing certain clothes and jewelry, cosmetic problems and limitation of daily activities for patients. It is common for lymphedema patients to experience depression, due to physical discomfort, emotional distress and lower quality of life. The indications, contraindications, and algorithm for selection of recipient site for the vascularized groin lymph node flap transfer. VGLN, vascularized groin lymph node; ISL,International Society of Lymphedema; Tc-99, technetium-99. Data source: Cheng MH, Chen SC, Henry SL, Tan BK, Lin MC, Huang JJ. Vascularized groin lymph node flap transfer for postmastectomy upper limb lymphedema: flap anatomy, recipient sites, and outcomes. Plast Reconstr Surg. 2013 Jun;131(6):1286-98. 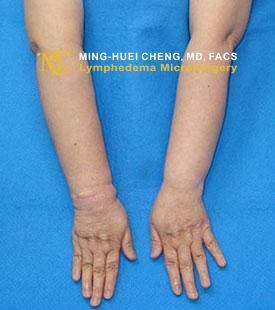 This is a 49-year-old female with right upper limb lymphedema for 6- months after right mastectomy and axillary lymph nodes dissection and radiation. At a 20- months of follow-up, the circumferential reduction rates of the affected limb without the use of compression garments were 85% and 60% above the elbow and below the elbow, respectively. 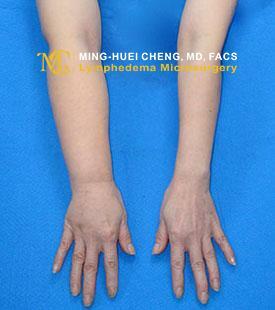 LVA is an advanced minimally invasive super-microsurgical technique used to relieve lymphedema. During the procedure, Dr. Cheng will make small incisions, which expose lymphatic channels and small veins just beneath the skin. In some cases, surgery may be performed to alleviate swelling and reduce symptoms. 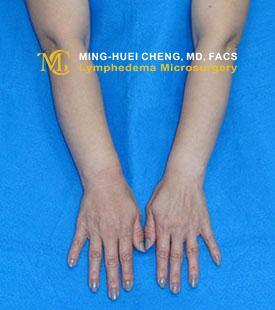 Dr. Cheng has developed a unique technique that involves lymph node transfer. 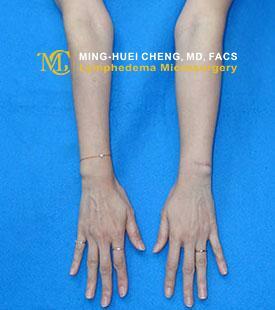 During the procedure, Dr. Cheng transfers lymph node flap to distal recipient site – dorsal wrist in the upper extremity or ankle in the lower extremity. If you have Breast Cancer Related Lymphedema and would like to know more about the most advanced treatments, contact Dr. Cheng. Internationally recognized as a leading lymphedema specialist, Dr. Cheng can discuss treatment options, based on your individual case. Dr. Cheng is a member of the American Society of Reconstructive Microsurgery and has performed numerous VLN surgeries on breast cancer survivors and other lymphedema patients. Vascularized groin lymph node transfer using the wrist as a recipient site for management of postmastectomy upper extremity lymphedema. Lin CH, Ali R, Chen SC, Wallace C, Chang YC, Chen HC, Cheng MH. Vascularized groin lymph node flap transfer for postmastectomy upper limb lymphedema: flap anatomy, recipient sites, and outcomes..
Cheng MH, Chen SC, Henry SL, Tan BK, Lin MC, Huang JJ. Plast Reconstr Surg. 2013 Jun;131(6):1286-98. Outcomes of Lymphedema Microsurgery for Breast Cancer-related Lymphedema With or Without Microvascular Breast Reconstruction. Engel H, Lin CY, Huang JJ, Cheng MH. 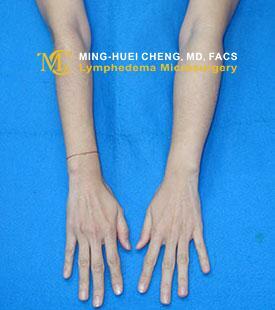 Greater Omental Lymph Node Flap for Upper Limb Lymphedema with Lymph Nodes-depleted Patient. Chu YY, Allen RJ Jr, Wu TJ, Cheng MH. Plast Reconstr Surg Glob Open. 2017 Apr 25;5(4):e1288. Ho OA, Lin CY, Cheng MH.